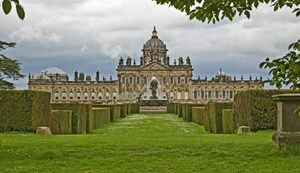 Castle Howard is one of the finest historical palaces across the United Kingdow. This beautiful palace was designed and built by the family of Howard. Here the English ceremonial spirit is never lull. To this day, it regularly organizes a Victorian drinking afternoon with tea and china cups, homemade jam and fresh cream. The construction of this unique palace started in the early 18th century, around 1701-1703, with the rise of the eastern wing. It is located in the English county of North Yorkshire, only about 24 km north of the city of York. Howard Castle remains one of the largest private homes in Britain and in fact is not a castle in the full sense of the word. The grand and ornate Baroque architecture, however, speaks more. Much of the interior decorations of the buildings are made from the famous master, Giovanni Antonio Pellegrini. Today, Castle Howard is available for tourist visits and tours. Especially attractive are the collection of works of art from, Gainsborough, Canaletto, Holbein and other famous artists. Wondering around the halls of the palace Howard you are unlikely to have feelings that you are in the museum. The great noble palace atmosphere is complemented by the ever-burning fireplaces, attractive beautiful crystal fruit bowls with fresh fruit on the tables, and unique vases with large and well arranged bouquets of flowers. The hereditary palace of the Counts Howard has gained great popularity after the filming of "Brideshead Revisited" by Evelyn Waugh. The protagonist in the movie - Jeremy Irons is in love with the Baroque building which is fully understandable.